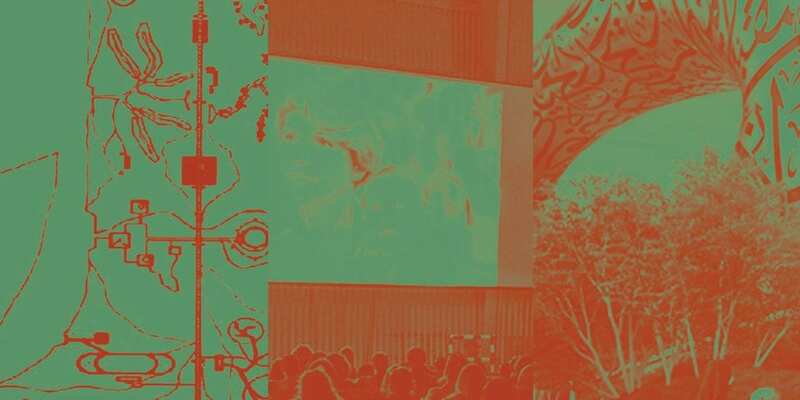 The Global Art Forum is an annual, transdisciplinary summit, based in Dubai, which combines original thinking and contemporary themes in an intimate, live environment. Since 2007, the Forum has been a key part of Art Dubai’s extensive cultural programming. It has brought together over 450 global minds from pop culture to renowned academia: artists, curators, museum directors, filmmakers, novelists, historians, philosophers, technologists, entrepreneurs, musicians and performers, dialogue with one another across disciplines, reporting from every part of the world, painting a truly 21st century portrait of how the globalized world thinks. The Global Art Forum is supported by the UAE Ministry of Foreign Affairs & International Cooperation, and the Office of Public and Cultural Diplomacy. 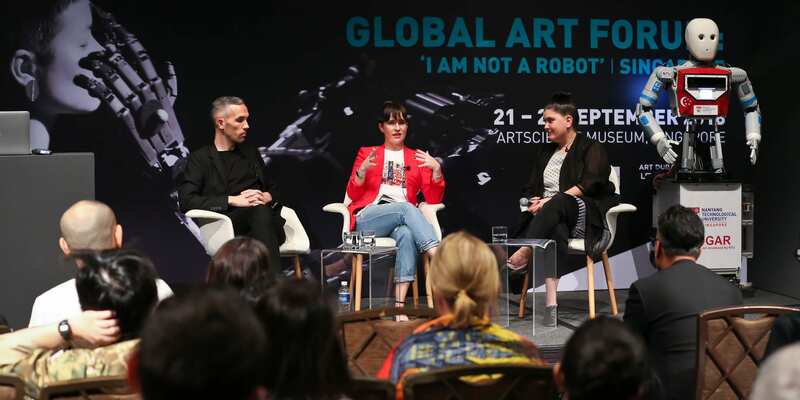 This year, The Global Art Forum has hosted multiple events, its annual conference in Dubai in February and March, which looked at the potentials of automation under the theme “I AM NOT A ROBOT”. Followed by, an event at the Royal Academy of Arts in London during July, which focused on the past, present and future of art, culture and ideas in the UAE. Most recently, the Forum travelled to the iconic ArtScience Museum in Singapore, a fitting location to revisit the theme “I AM NOT A ROBOT” since Singapore is striving to become the world’s first Smart Nation. Click the images below to discover more about each event. Art Dubai’s Global Art Forum: ‘I Am Not a Robot’ was the latest in a series of events that explored the power, paranoia and potentials of automation. Previous iterations took place in Dubai in February, and at Art Dubai in March of this year. 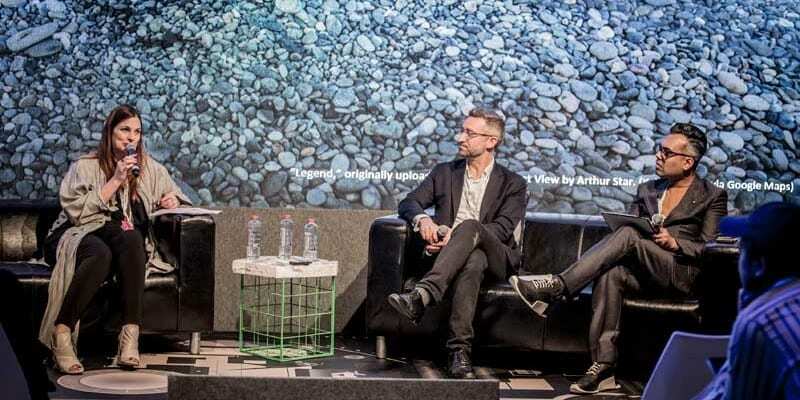 The Singapore edition was a partnership between Art Dubai and ArtScience Museum, comprising of a three-day conference that investigated the opportunities, complexities and trepidations of artificial intelligence, machine learning, networked systems and robotics. To read more about this conference, click here. This special edition of Art Dubai’s Global Art Forum — held in partnership with the UAE Ministry of Foreign Affairs & International Cooperation, and the Office of Public and Cultural Diplomacy — took place for the first time at the Royal Academy of Arts and focused on the past, present and future of art, culture and ideas in the UAE. This evening’s event gathered some of the most notable protagonists from art, architecture, cinema and futurism, to share stories about one of the fastest changing places in the 21st century. To read more about this conference and watch the talks, click here. The 12th edition of the Global Art Forum focused on the power, paranoia and potentials of automation. Entitled “I Am Not a Robot”, the transdisciplinary summit was programmed by Commissioner Shumon Basar, with Chief Operating Officer and Futurist-in-Chief of the Dubai Future Foundation Noah Raford, and Curator of Digital Culture & Design Collection at the MAK, Vienna, Marlies Wirth, as Co-Directors. To read more about this event and listen to podcasts of the talks, click here.